I’m sure those of you that have a blog with Squarespace, can already attest to the improved traffic and leads you’ve received as a result of blogging. But as you know, there are always new things to discover, and I’m also sure you’re always constantly looking for tools, tricks, and techniques to continue to refine your blogging efforts. In today’s blog post we’re simply going to look at 7 Quick Tips for blogging with Squarespace. These will range from tips to setting up a Google analytics account, SEO tips, writing tips, to tips that will help you manage your content on the go. Let’s jump straight into it. While not Squarespace specific – as this is a tip I’d recommend for any blogger – I will include Google Analytics here as it’s easy to overlook especially if you’re a small business owner with lots on the go. You need to create a Google Analytics account so that you can track your traffic. Where is your traffic coming from? What social media channels? What country? What is the demographics of your traffic? How long do they spend on your site? What is your most popular article? What is your bounce rate? These, and many, many, more metrics can be analyzed with Google Analytics. Sign up for Google analytics (it’s free). You will be given a tracking code. Within Squarespace Home Menu, click Settings, click Advanced, and then finally click External Services. Paste your unique tracking code in there and you’re good to go. This is a tip that I read in a post on Red Lantern Creative. 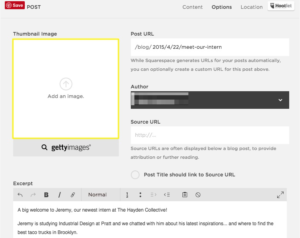 It’s a simple, yet an incredibly effective tip for blogging with Squarespace. Keyword inserted into the title? Keyword in the first paragraph? 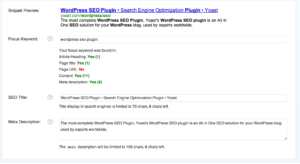 Keyword in the body of your post (avoid keyword stuffing)? Keyword in heading and sub-headings? Keyword included in your image Alt Tag? Is post length 300 words or more? 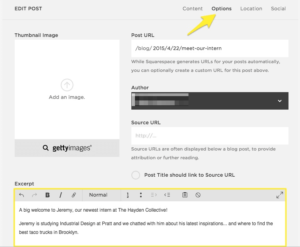 You want your readers to comment on your blog posts. This creates engagement and ensures your site doesn’t look like a ghost-town. While it’s all very well to have a ton of comments on your blog, what does it say about your company if you’re not responding to comments? To solve this problem we simply suggest that you subscribe to your own blog posts. 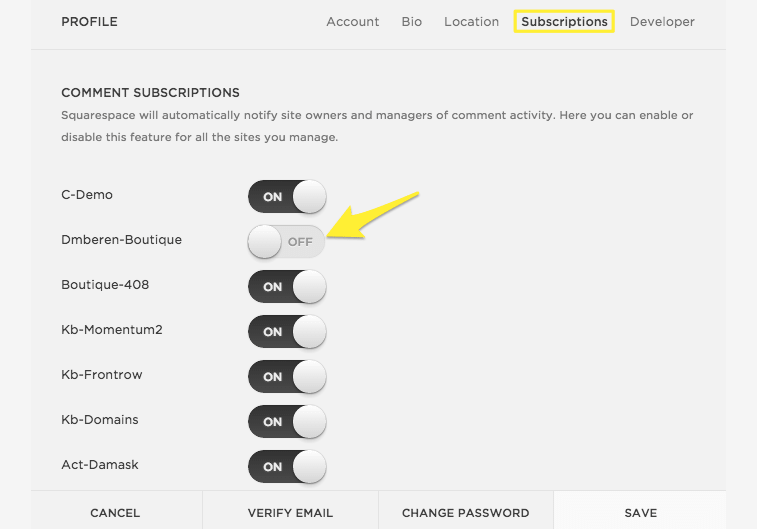 By subscribing, you’ll get an email every time there’s a comment on your site. To do this click on Home Menu, Edit Profile, and Subscriptions. As someone who loves writing, I’m continuously playing around with my writing process. When I started, I found that I would edit as I went along. The problem with this, I find, is that it stifles the creative process. I found I was trying to be perfect the piece as I went along, instead of letting my creative juices flow. What I now do (or try do) is get it all out on paper in one go. Consider applying this to your blog writing process. Create the first draft and save it in the Needs Review Category. Then come back to it later with a new set of eyes and make the necessary edits. Once edited it is now the final draft and you can either hit publish, or schedule your post to go live at a later stage. 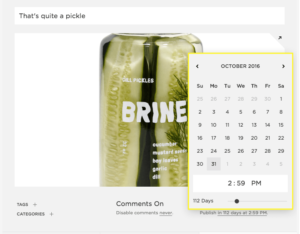 The schedule feature works particularly well if you’re creating a backlog of articles for scheduling over the next few months. It ensures a constant flow of articles even when you’re not in front of your computer. Visit your blog page by clicking Home Menu, Pages, and Blog Page. Choose your post and then click edit. Add a post excerpt by clicking on Options. It’s important to have an image and a suitable image at that, as it grabs the readers attention, improves click-throughs, and increases the chances of more shares. Humans are after all visual beings. So while you’re creating a blog excerpt, take things further, make your site more social media friendly, and add a thumbnail image. This is the image that will be visible when shared on social media channels like Facebook. 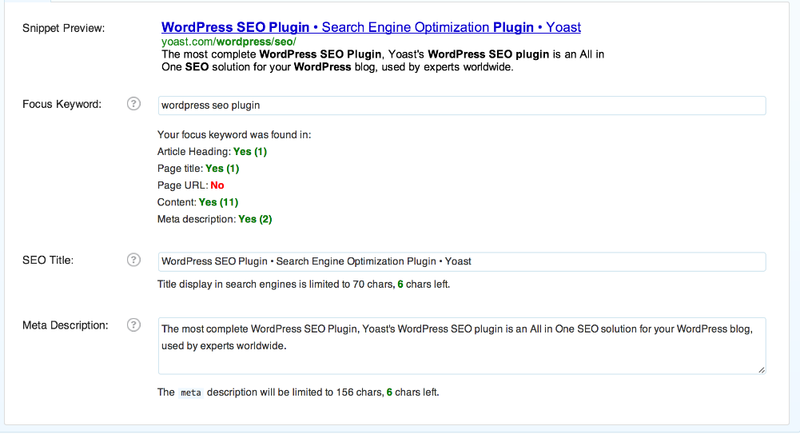 This is the image readers will see in addition to the blog title and meta-description. 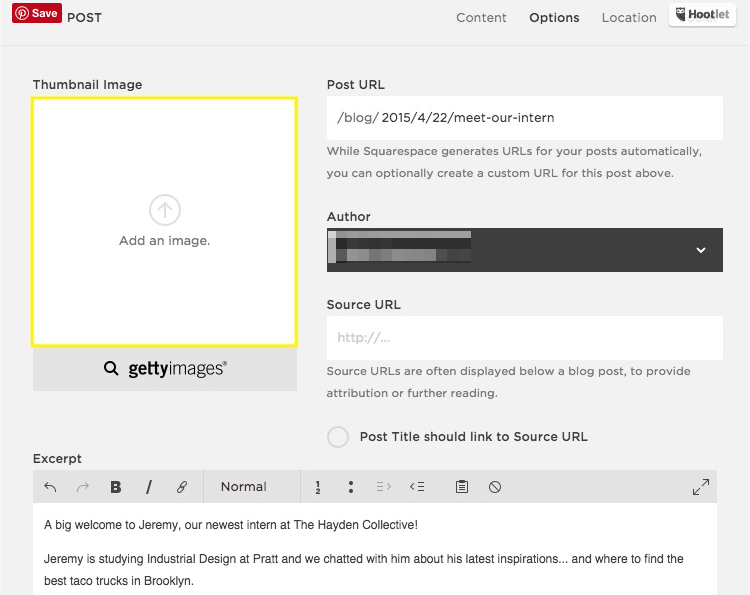 A final tip to blogging with Squarespace is to download the Squarespace Blog App. With the App, you’re able to write, edit, tag, and schedule posts from your smartphone. Managing and responding to blog comments is also possible. This means instant access on the go. And if you find a typo that you missed after publishing, you’re able to immediately fix it. 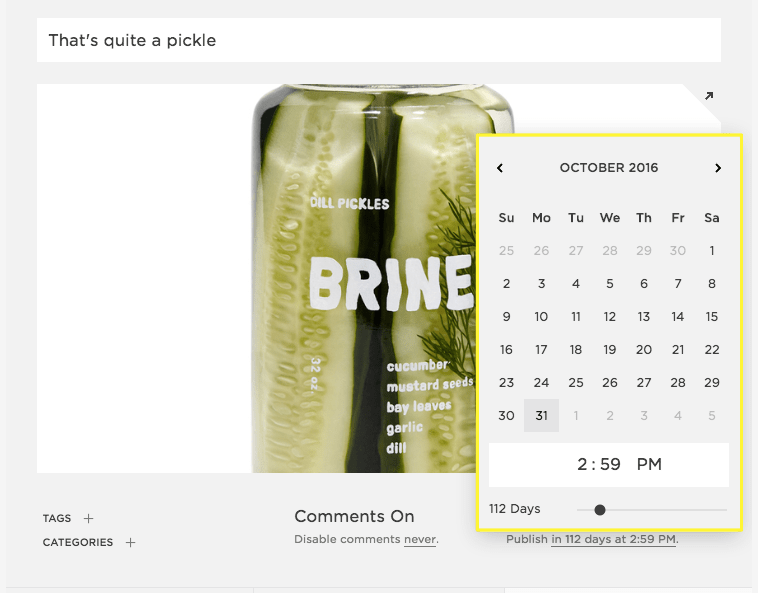 There we have it – seven quick tips for blogging with Squarespace. Do you have any additional tips? We would love to hear from you in the comments below.